Just doing our presentations for the start of our web and online projects. I’ve made a presentation which outlines my work, it was an interesting process thinking through the project and putting it all together. Have been back from France for a few days now and I have been working on my mockups today for the new Adur Design website. I’m designing the pages with a view to the wordpress build, I’ve used screen grabs to get a feel of how the final pages will look. I think that bending the carousel plugins will be a challenge but not too bad. Its just a question of getting the right plugin which fits the spec as closely as possible. There is some great stuff out there, good to see the variety of design and the effort that the developers put into the themes. I like weaver 2.2 which seems like a robust and well designed theme, I may use this for my project. I have shot some excellent video over the last few days down at the beach, I’ll post some here so you can have a look. Lovely light at the moment for taking photos, we’re having clear crisp autumn days where the sun is low and the shadows are long. Will post some latest pics shortly. 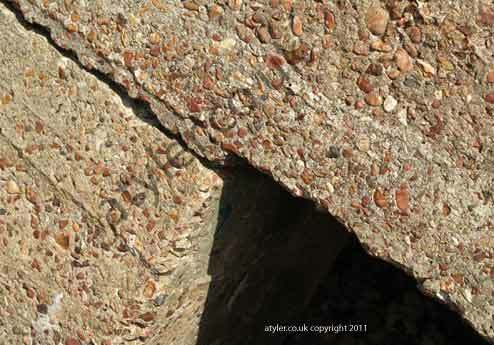 Here is a close-up of a ww2 bunker that is close to my local beach, its quite a small bunker and has been left pretty much intact apart from the front being blocked up. The close-up makes a good abstract shape, this area is part of the entry doorway and I like the way the shadow falls on the and the angles created.